Gospel For Asia says it is not surprising then that many villagers seek help from local witch doctors and traditional practices that can actually make their conditions worse. Giving careful, thorough examinations, Dr. Nipun (pictured) prescribes medication donated by a hospital. GFA-supported medical camps are bringing wellness to some of the 3.8 billion people in the world who lack access to basic health care. At these camps—often hosted in rural villages without medical facilities—many participants are visiting a doctor for the first time. Medical camps also aim to educate by addressing false beliefs and fears and correcting misinformation. After some time in prayer, Pastor Ganesh decided to organize a free medical camp. At the camp, locals could be seen by a doctor and prescribed medications at no cost. Ganesh reached out to the nearest hospital for help. The hospital generously donated medication to be dispensed under the supervision of a doctor. Next, Pastor Ganesh needed to secure doctors to see the patients. Two doctors agreed to travel to the remote location and see more than 100 patients each in one day. Ganesh and his wife traveled to remote villages to tell residents about the free medical camp. More than 200 villagers came for treatment. Giving careful, thorough examinations, Dr. Nipun prescribes medication donated by a hospital. 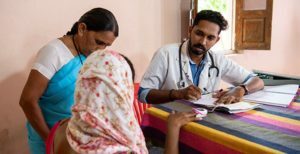 Dr. Nipun was impacted by the poverty and sickness he saw at the remote medical camp and offered to come free of charge to future GFA-supported medical camps in the area. (1) Tracking Universal Health Coverage: 2017 Global Monitoring Report. World Health Organization and International Bank for Reconstruction and Development / The World Bank. http://pubdocs.worldbank.org/en/193371513169798347/2017-global-monitoring-report.pdf. 2017. (2) Chipman, Andrea. Access to Healthcare in Asia-Pacific. The Economist Intelligence Unit. http://accesstohealthcare.eiu.com/wp-content/uploads/sites/42/2017/06/AccesstohealthcareinAsia-Pacific.pdf. June 2017. (3) Psarris, Emily. Solutions to Poverty-Line Problems of the Poor & Impoverished. Gospel for Asia. www.gfa.org/special-report/solutions-extreme-poverty-line-poor-impoverished/. November 15, 2018. (4) Ballesteros, Carlos. Half of World Lacks Access to Basic Health Care: Report. Newsweek. https://www.newsweek.com/world-bank-who-health-care-poor-global-access-748117. December 2014.